The Graduate Aptitude Test in Engineering (GATE) is one of the competitive exams conducted jointly by 7 IITs to check a candidate’s knowledge in Engineering Mathematics, verbal skills and the particular subjects of their graduation. Those who want to get admitted for M.E/M. Tech must clear this exam. Since it is a national level comprehensive exam, the competition will be quite high. Chemical Engineering will be chosen by many students after graduation in a specific field. Apart from joining the masters, you can also join many Indian Public Sector Units as they recruit some entry-level employees with the valid GATE score. The GATE Chemical Engineering syllabus includes 70% marks of core subject and 15% marks for General Aptitude and Engineering Mathematics respectively. Thus every candidate must consider GATE Chemical Engineering preparation seriously to get qualified in the exam. Here are 10 tips to clear your GATE Chemical Engineering test. Before going to the tips, let’s check the eligibility for GATE. Those who are in the final year of qualifying degree or completed their graduation in Chemical Engineering with no arrears. Follow these tips for your GATE exam with proper planning and hard work which are very important to attend any competitive exams. In order to qualify GATE exam, you just need a simple plan which can be followed strictly. Before starting GATE Chemical Engineering preparation, know the entire syllabus thoroughly. The syllabus is categorized into three parts. Check out the category and the marking schemes below. The best GATE coaching in Kochi refers the top-notch books for the reference and to prepare sample questions papers. So, if you don’t know which books to refer, it is advisable to approach the best coaching center too. Choosing the best reference books will help you cover all the important areas of syllabus, exam pattern etc. as mentioned earlier General Aptitude and Engineering mathematics cover 30% of the marking schemes. Chemical engineering paper has the advantage of getting an easy Mathematics paper compared to other branches. So, try to score more marks in this section. Also check out the educational apps for learning. Chemical Engineering paper can be divided into two main parts as mentioned earlier: small syllabus and large syllabus of core subjects. The small part has 4 main subjects whereas the large part has 6 main subjects. All the subjects must be studied thoroughly. GATE coaching in Kerala is quite famous for attaining every detail of subjects to get a good score in GATE exam. Having proper concept of every topic is a must and there is no short way to attain it. It is not simple to predict which topic will have more questions in the exam, so all the candidates are advised to cover all the topics in the entire syllabus. Success won’t be yours unless you plan right for the exam. Preparing a study plan is very important to get a good score in the GATE exam. It is inevitable to make a study plan for GATE Chemical Engineering preparation and it must include daily, weekly, and monthly plans. Don’t make plans that you can’t follow. So, allot time for other entertainments too. Spend 4-5 hours daily for the GATE preparations. Try to start preparing atleast before 3 months, because since it is a vast syllabus you won’t be able to cover all the topics within a less period of time. When you look into the core subjects, there are two subjects, namely, Plant Design and Economics and Mechanical Operations, which are quite easy to learn. Revise those subjects every week and since it is formulae based, you can make notes of it and revise every now and then apart from main preparation on a daily basis. If you do so, you can score full marks in these subjects for sure. Try to find time for Process Calculation and Chemical Technology on a daily basis. This paper is like General Aptitude and Mathematics where practice makes you perfect. Process calculation requires good numerical abilities to solve problems which can only be gained through daily practice. However chemical technology questions will be memory based, so there is a chance of forgetting important points if not revised regularly. Also, try solving previous year question papers and sample papers online. If you have enough time to prepare, solving questions papers can be done daily for your completed portions. This gives you a good idea about the topic and marking schemes too. Also check out GATE self study. 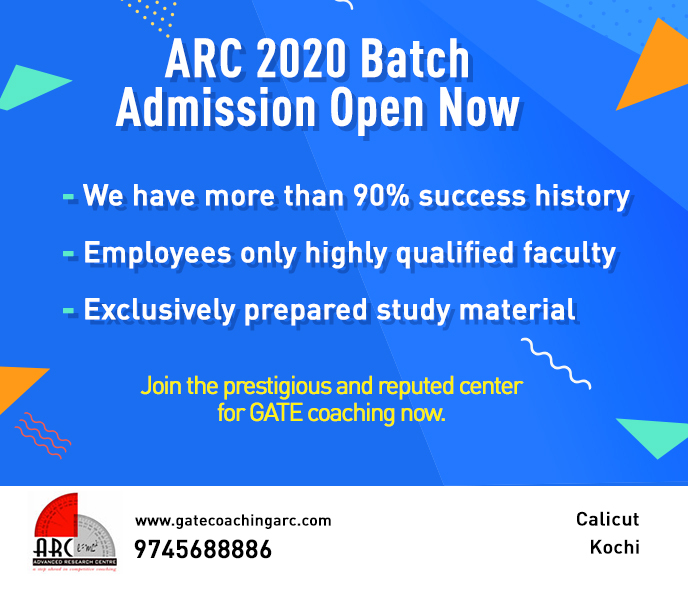 If you want a good score in the test, the best institutes for GATE coaching in Kerala suggest you revise the whole syllabus after careful preparation. It will give a firm grip on all the subjects including core topics and common ones. Aptitude and Mathematics are two easy subjects which can be scored well if you prepare seriously. To attain a high score in these sections, you have to be confident too. If you have studied with full commitment during B.E/B. Tech course, preparation of just 3 months is needed along with a good GATE coaching in Kochi. But if you are not clear with the basics, a dedicated preparation of 6 months will be required. Whatever the case, revise thoroughly when you complete preparing the whole syllabus. Also read about GATE mock exam. There are 6 main subjects with larger syllabus. So, choose any three of them you feel comfortable with than the other three. Study them with proper planning and revise it completely. While preparing never forget to make short notes of the sections you are going through. Get a grip over these subjects and then choose the next three. If you prepare with full confidence and a systematic way, you will surely excel in GATE exam. Making notes has helped many GATE toppers as it sorts out the most important formulas and concepts. It also helps to improve the concentration in studies and the candidates can refer to the crisp concepts before the exam as it is difficult to revise the entire syllabus on the previous day. Understand that following others plan may not work for you and vice versa. You are free to make your own plans and strategies that can be followed easily. If you have your own plan, strictly follow them and success will be yours for sure. You know your timings well and you are the best person to plan and judge your days. But if you are bad at planning, best institutes for GATE Chemical Engineering preparation set you a routine plan for the entire syllabus. One of the important tips you must keep in mind is that never leave any topic unread in any subject. Every chapter in all subjects is equally important and even though there is weightage for each chapter, you won’t know which question is going to be easy or difficult. Sometimes the easiest ones will be skipped while preparing. Score extra 15-20 marks without any effort by keeping an eye on each topic included in the syllabus. Besides following these most important 10 tips, there are some things to be avoided while preparing for your GATE exam. First and foremost thing is not to get stressed during preparation. Also, overconfidence is not at all good. Understanding the syllabus thoroughly helps you to focus only on the required subjects. Making notes and revising the topics will definitely help you crack GATE Chemical Engineering exam.